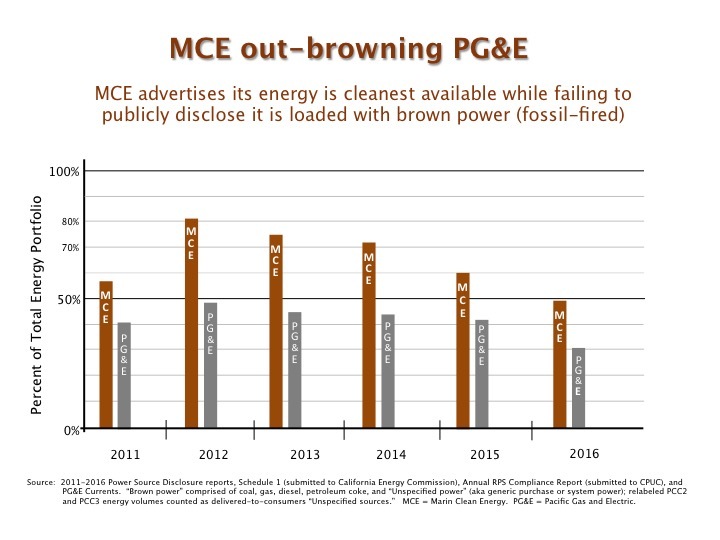 A review of Marin Clean Energy's (MCE's) brown power volumes from 2011 through 2016 (latest year available) reveals an altogether stunning and troubling picture that calls into question everything about the clean energy agency. MCE is loaded with dirty power. If MCE leadership is aware of what is happening, how can it idly stand by as MCE does the opposite of what it advertises about unhooking from dirty and dangerous fossil fuels? More to the point -- How can MCE advertise itself as being so green when it is so brown? This chart is not an opinion -- this is what is in MCE’s and Pacific Gas and Electric's (PG&E's) complete regulatory filings. This is the first in a series that will enable you to verify brown power volumes and GHG claims independently of advertising, salespeople, or even this writer’s observations. This is necessary for addressing what MCE's P.R. department releases for public consumption (20 of MCE's total staff of 58 work in public affairs / public relations). RECs are little more than a receipt, akin to a sales slip you receive from a grocery store for a loaf of bread or carton of milk. Unlike a grocery store receipt, a REC is an electronic file that shows (i) name & location of renewable energy resource, (ii) renewable energy type (solar, wind, etc), (iii) date of generation, and (iv) amount of energy created in megawatt-hours (MWhs). (An average residence in MCE’s service area consumes about 6 MWhs per year). PCC 1 (Portfolio Content Category 1, aka Cat 1 or Bucket 1). Many consumers are under the mistaken impression that all of their renewable energy is PCC1. This is understandable considering that MCE's Opt Out mailers (automatic enrollment notices) advertise as much. There is another group known as PCC 0. This is a separate grouping of contracts or ownership agreements that are governed by special rules for contracts executed before June 2010. These contracts are grandfathered into California's renewable energy statutes. MCE treats all of its (non-transparent) PCC 0 contracts, provided by Shell Oil, as zero-GHG emissions. PG&E’s regulatory filings show zero PCC2 energy volumes. The filings identify one PCC3 energy volume -- that volume was reported to regulators along with an equal volume of “unspecified power.” Unlike MCE's practice, PG&E discloses and reports this corresponding delivery of brown power and includes it in its overall energy portfolio's annual GHG emission rate. This is the emission rate against which MCE measures its own performance. California regulators acknowledged no one could comply with the state’s governing clean energy law – the Renewable Portfolio Standard. There simply was not enough clean energy in California to satisfy the law. The availability problem was compounded by an over-stressed electric transmission system from the Pacific Northwest (PNW) that did not have the capacity to deliver renewable energy volumes to satisfy California's demand. Those capacity issues were accentuated by PNW wind farm output that tended to peak in mid-March and June, frequently competing with hydroelectric output from the same geographic region, thereby creating more congestion on those transmission lines during those months. Thus, low cost PCC2 and cheap PCC3 instruments were created as a workaround – basically a hall pass -- until enough in-California PCC1 energy was constructed to meet the state's RPS-driven demand or until transmission system upgrades were completed to the PNW power path. Regulators allowed entities such as MCE to add specified limited amounts of PCC2 and PCC3 to their reported renewable energy volumes, thereby satisfying their annual RPS statutory mandate. However, the state’s hall passes did not grant MCE (and other Community Choice Aggregators (CCAs)) the right to advertise those PCC2 and PCC3 volumes as delivered zero-GHG renewable energy when it was actually delivering dirty power. MCE board -- your agency is cleaning the air... with brown power? In one of its most misleading years on record MCE exceeded California's specified limits for using PCC3-type instruments by 600%. Most of them were surreptitiously retired as "voluntary" energy -- a misleading invention that MCE used to bypass the RPS's specified limits on using PCC3 energy. MCE then promoted itself as "voluntarily exceeding California's renewable energy requirements," having used 203,029 of the instruments when it was limited to 28,500. MCE's problem was not just that it was voluntarily adding this stuff to its energy portfolio, but more seriously that it was exploiting consumer naiveté and ignorance by delivering huge amounts of brown power to ratepayers while advertising it was clean energy. MCE's continuing bait & switch abuses triggered a class action lawsuit. The suit was ultimately dropped because the law firm presenting the class action wanted a Deep Green claimant and was unable to locate a party willing to stand in the public arena alongside the class's Light Green claimant. While MCE was advertising an impressively clean energy portfolio (few pounds of CO2 per megawatt-hour), it was also accruing a substantial cash accumulation through its relabeling scheme. According to MCE’s 2018 & 2017 Financial Statements, the not-for-profit agency now holds $34 million in cash and cash equivalents. While emitting millions of pounds of stealth GHGs, MCE saves a typical household $2.95 per month compared to PG&E. That's enough to purchase a package of snack cakes.